Summary: Nick and her cousin, Helena, have grown up sharing sultry summer heat, sunbleached boat docks, and midnight gin parties on Martha's Vineyard in a glorious old family estate known as Tiger House. In the days following the end of the Second World War, the world seems to offer itself up, and the two women are on the cusp of their 'real lives': Helena is off to Hollywood and a new marriage, while Nick is heading for a reunion with her own young husband, Hughes, about to return from the war. Another book that got a lot of buzz at this year's BEA was TIGERS IN RED WEATHER by Liza Klaussmann. Once again, I totally see why! This debut novel, which just happens to be written by Herman Melville's great-great-great-granddaughter, was a wonderful read; and it was one of my favorite books that I read on this year's beach vacation. TIGERS IN RED WEATHER tells the story (well actually five individual's stories, but more on that later) of two cousins, Nick and Helena, and how they dealt with marriage, motherhood, and a tragedy. The book begins at Tiger House on Martha's Vineyard at the end of World War II with Nick and Helena looking forward to the endless possibilities that they have for their futures. Helena is moving to Hollywood to follow her future husband and Nick is anxiously awaiting the return of her husband Hughes from the war. However, things quickly change for both women -- Helena's husband ends up being Trouble (that's with a capital "T") and Hughes is merely a shell of the man he once was. As I mentioned earlier, I was very impressed TIGERS IN RED WEATHER. The characters, the writing, the story, and so on were all terrific in my opinion; and I couldn't turn the pages fast enough. One thing that stood out to me was how the story was told -- through the eyes of five different characters, Nick, Daisy, Helena, Hughes, and Ed. The novel was actually divided into five sections based on whose story was being told; and not only did I love getting to understand each character in this way, but I also loved how the author intermingled all of their stories to make one big story. I thought it was extremely well done! Another appealing thing about TIGERS IN RED WEATHER were the characters themselves. I'm not sure that I had a particular character that resonated with me; and if I'm being entirely honest, I don't think I really loved any of them; however, I did find all of their stories to be fascinating. All five of these characters were deeply troubled individuals, all losing their innocence in one way or another; and it seemed like the worse off they were, the more interested in them I was. I probably should mention that there were times that I thought their stories might be filled with a little too much drama (especially Helena's story), but overall they worked for me and kept my attention. I also really appreciated how this novel explored all sorts of family relationships -- from parent/child, to husband/wife, to cousin/cousin, etc. While many of these characters' interactions were fascinating, I think the author did an especially good job in showing the nuances of Nick and Hughes' marriage. After Hughes came back from the war a totally different man, Nick found herself trying to fill that void with casual affairs. Needless to say, their behavior, along with the guilt each one felt, did nothing to bring back the strength of their marriage. Their tense exchanges, as well as their ability to keep secrets, was emotional reading for me and at the same time horribly sad. Their troubles and pain just seemed so real. One last thing I'd like to mention is that there is a slight murder angle of the story. I wouldn't call this a murder mystery by any stretch, the identity of the murderer is revealed before the end of the novel. Some readers might appreciate this aspect of the book so I wanted to mention it. However, I appreciated the murder for another reason -- I loved how this one event set so many others into motion. 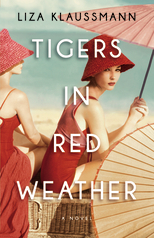 TIGERS IN RED WEATHER would make an excellent book club pick. Unfortunately, I wasn't able to locate a formal reader's guide, but don't let that stop you from choosing this novel. There are so many things to discuss, namely the various characters' personalities and motivations as well as their relationships with each other. However, you will also want to delve into family dynamics, marriage, addiction, mental illness, secrets, parent/child relationships, infidelity, and the loss of innocence. Truly, this book is full of intriguing topics! I highly recommend TIGERS IN RED WEATHER for fans of literary fiction and especially books about troubled families. I received a copy of this novel at the BEA 2012. This one sounds good. Adding it to my list. Thanks for the review! I'm going to send people to your review -- you've captured the story so fully (and communicated how much there is to discuss). Even though I didn't like any of the characters, I loved the 5 voices Klaussmann used to tell the story from the various perspectives/angles. It's interesting that both you and Dawn said you weren't crazy about the characters yet loved the book. I really like that time period and am looking forward to this book. You are reading so many good books lately! I love the cover of this book too. sounds like another good one. I think I've only seen good reviews of this one, minus the characters being unlikeable...or at least not as likeable as readers want them to be. Yours is actually first wholly positive review of this book I've seen -- which makes me happy as I'm dying to read this one -- it looks marvelous. Yes...I want to read this too. I had no idea about the author's connection to Melville. How cool!